That’s So Raven premiered on the Disney Channel on January 17th, 2003. Here, a contributor remembers how Raven’s style—specifically one pair of jeans—still helps her make creative choices every day. A silk cheetah-print blouse. Shiny black pleather pants. A scrawny Black girl with no fashion sense—just an obsession with Raven Baxter and a dream. This is the most accurate (and least painful) way to describe my tween years. Yes, there really was a time when I wore cheetah print and pleather in the same outfit, and no, I did not accept constructive criticism or fashion advice from others. It was a time of adventurous sartorial choices and outfits fueled by nothing but pure confidence. It was the early 2000s, and the iconic show That’s So Raven had inspired me to take fashion risks I’d never dream of taking now. Raven Baxter, played by the talented (and at times controversial) actress Raven-Symoné, was the guiding light of my prepubescent years. There were other Black actresses with lead roles in youth-oriented sitcoms, such as Kyla Pratt in One on One, Tia and Tamera Lowry in Sister, Sister, and Brandy in Moesha. But no one had quite the same style, humor, and flamboyance of Raven Baxter. The multitude of outfits she wore throughout the series’ four seasons encouraged countless Black girls like me to have fun and take chances when it came to fashion. Because that’s certainly what Raven did. 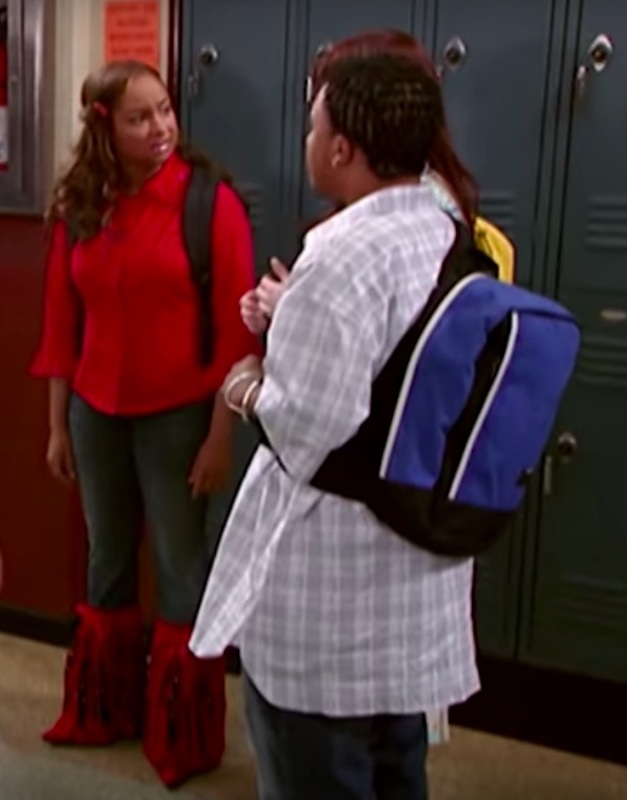 In an episode titled “Close Encounters of the Nerd Kind,” Raven casually hangs out with her friends while wearing a pair of gigantic, bright red fringe boots. Just because. 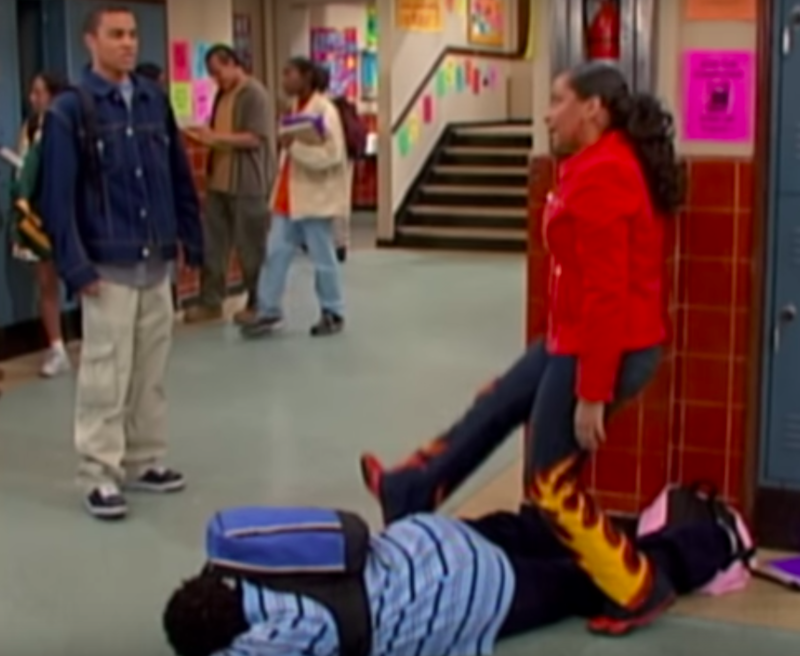 In that episode, Raven wears a certain pair of jeans that I—for all of my childhood, and for most of my adult life—have thought about constantly. These jeans redefined the boundaries of fashion, and solidified in my heart the idea that I can wear whatever I want. And it will be fabulous just because I say so. These jeans were dark-wash, mid-rise, and boot cut, with yellow flames embroidered along the pant legs. The flames reach up to around Raven’s thigh area, so every time she takes a step, it looks like she is dancing on the sun. I had never before seen such an ostentatious article of clothing, and my 13-year-old brain couldn’t process the bravado it took to even consider wearing something like that. On the 16th anniversary of That’s So Raven, I would like to give thanks and celebrate the legacy of a show that encouraged so many young people—but especially Black girls—to be confident and have fun when they get dressed. Any time I start second-guessing an outfit, I think about those flame-embroidered jeans and remind myself that almost anything can look great if you have the courage to pull it off. But it’s not like you needed psychic ability to know that.